WASHINGTON — Alaska's senators are caught square in the middle of the Senate GOP's will-they-or-won't-they dance on repealing and replacing the Affordable Care Act. As details trickled out about the thus-far secret Republican health care bill on Capitol Hill on Wednesday, the likely votes of Alaska's Republican Sens. 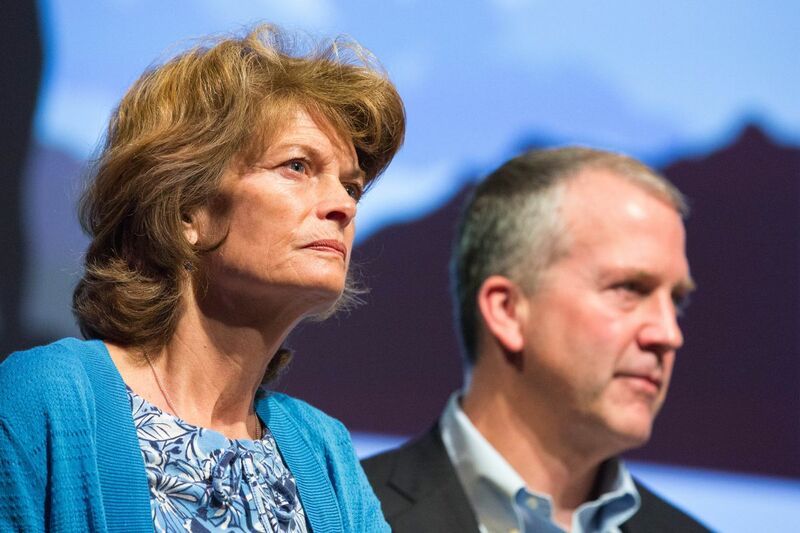 Lisa Murkowski and Dan Sullivan continued to be a source of political speculation. Alaskans face some of the nation's highest health care costs; the state's individual market has only one remaining insurer; and more than 33,000 additional people receive Medicaid under the state's now-expanded program. Analysis showed that the House-passed bill would do little to solve Alaska's problems, and raise premiums for many in the state at rates that far outstripped the rest of the nation. Both senators have lamented the closed, secretive process by which Majority Leader Mitch McConnell, R-Kentucky, has managed the health care bill, without any hearings. The bill, or at least some of its details, will be released Thursday morning, and McConnell plans a vote on the legislation by the end of next week. But neither senator has pledged to withhold their vote in response to the closed process. "Overall, I believe that we can do better for our state and our country. And I will not vote for a bill that will make things worse for Alaskans," Sullivan said Wednesday evening. In the morning, Murkowski made clear that she is concerned about the bill's quick timeline. In an interview, the senator said that she needs enough time to determine how the bill will impact Alaskans. Wednesday afternoon, a reporter saw Sullivan and Murkowski head into a private meeting in McConnell's leadership office, which Sullivan later confirmed was about the bill. Two senators from Alaska - where Obamacare premiums are sky high - are in the Sen Majority Leader's office right now. Both senators have previously said that they don't want to roll back all parts of the Affordable Car Act. Both want protections to remain in place for people with pre-existing conditions and to allow young people to stay on their parents insurance. They have expressed varying degrees of support for keeping Medicaid expansion in place. Both senators also want to see a repeal of the mandate that most employers provide and most individuals purchase health insurance. Murkowski has pledged support for Planned Parenthood, which is likely to be a target of the GOP health care bill. Sullivan is not opposed to removing funding from Planned Parenthood. But just what tips both senators to a "yes" on major health care legislation remains murky. Sullivan sought to bring a little more clarity to the matter Wednesday morning with a video message sent out to constituents who have signed up to receive emails, and those who have contacted his office about health care. "It's a personal and complex issue and I want you to know that I'm listening to all of your concerns," Sullivan said. Senate leadership should have been more open in writing the bill, he said. But the stakes are high and "something has to be done, and it has to be done soon," Sullivan said, indicating that the lack of a public process, or hearings, would not keep him from voting in favor of the bill's passage. Sullivan said he has been "relentlessly" working to educate Senate leadership about the particular circumstances faced by Alaska, a small state with high costs. To that end, Sullivan said he has focused on three main issues: stabilizing the state's individual market; making plans more affordable for Alaskans who are not currently receiving federal subsidies to offset the high cost of health insurance premiums; and finding "a sustainable and equitable path forward for Medicaid." Sullivan said he did not want to "pull the rug out" from under Alaskans receiving Medicaid. Between the lines, that may mean that he is in favor of a gradual step-down in Medicaid spending so that no one in the state abruptly loses coverage.